I’m a sucker for local multiplayer games. There’s something about enjoying a cool moment with someone physically next to you, or goading someone who can see the venom in your eyes or finally swearing at the face of someone who may just be better than you. 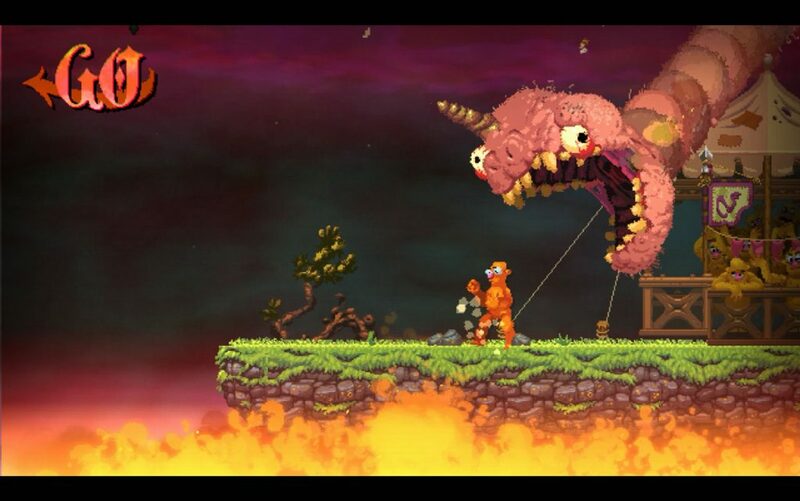 Nidhogg 2 is the epitome of this action, a game where in a brutal tug of war you must duel your way across a map to be the first to get eaten by your opponent’s giant worm. In Nidhogg 2 you must traverse a number of screens with an infinite number of spawning opponents coming at you one at a time. Your opponent must kill you and then move momentum in the opposite direction. With jumps and rolls players can traverse the screens with relative ease except for the occasional trap like a fall to the death or a floor based meat grinder. 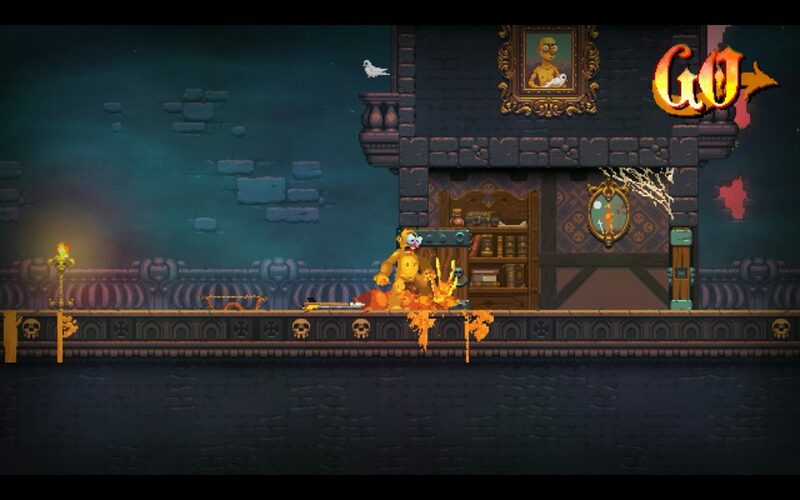 With Nidhogg 2 the series has moved past its humble beginnings of rapiers for fencing and now has a small arsenal for the players to duel with. In one on one combat the two players can spawn with a rapier, broadsword, dagger, fists and bow and arrow. Each has its benefits and hindrances, the dagger is very short-range but if you take advantage of the weapon throwing feature it will go at a crazy pace. Alternatively the bow and arrow gives you the advantage of range but the opponent can reflect the arrow right back at you with a well-placed weapon. The new weapons are interesting, they give some variety to what could be a simple experience with the first game, the problem is that it doesn’t seem balanced yet. The bow and arrow gives the opponent so much time to react you may as well just whip the thing at their heads to at least disarm them, and yourself. 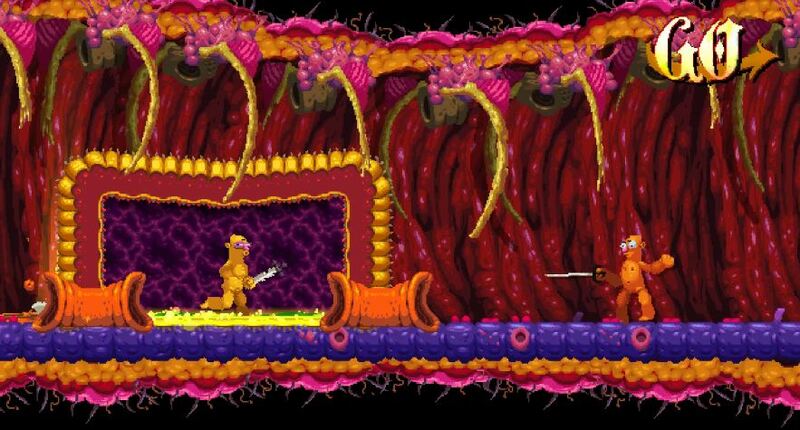 Nidhogg 2 on the face of it seems like a simple game, and it is, but like any good beat’em up there is depth if you go looking for it. Although yes you can just run past your opponent to start pushing screens over you may want to consider doing a dive kick first to knock a weapon out of their hands so that they can’t throw something whilst you run away (bravely), your opponent might then want to consider not chasing you as you’ll run at the same speed but instead running away (bravely) to cause themselves to respawn closer to you to get a quick kill in and change the momentum of the game. It’s easy to be fooled by the simplistic explanations of the game and the graphics to think this is just a throwaway experience but there are so many strategies and ideas at play in Nidhogg 2 that you can’t help but respect it. There’s a myriad of rules you can turn on and off in Nidhogg 2 including the ability to remove certain weapons you are not a fan of. All of these can be enjoyable to play around with, especially if you’re looking for a bit of Nidhogg classic action. Whilst none of these rules are particularly ground-breaking I do highly recommend boomerang weapons as a real shakeup to what you would expect. There is player customisation, allowing you to pick colours and clothing for your character but to be honest you’ll be dead or sprinting 90% of the time so there isn’t too much point putting effort into this section of the game. The first Nidhogg was an homage to 8-bit, a barebones pixel masterpiece that had fluid animation and action. You did your best to get across the map without your yellow or orange blood spraying out like a Lone Wolf and Cub film extra. When Nidhogg 2 was first announced there was a quite sizable backlash to the change in direction for animation. Gone was the sleek pixel 8-bit homage, and instead we now have almost 16-bit inspired work. For me personally I did prefer the original games style somewhat more but that is not to say that an evolution of the art hasn’t got some merits. 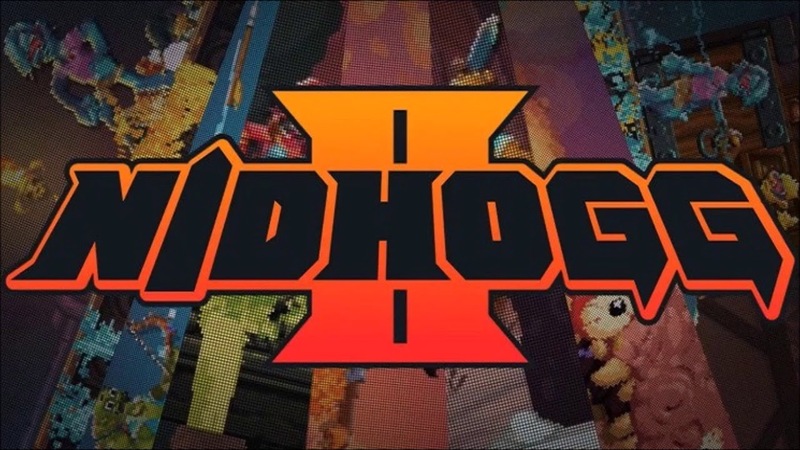 The 10 stages offered in Nidhogg 2 are all featuring great design and artwork. Each stage is offering up something different for the players some are relatively flat affairs whilst others feature raised floating platforms or, my personal favourite, the forest stage with its tall grass you can crouch in causing no end of trouble for your opponent.